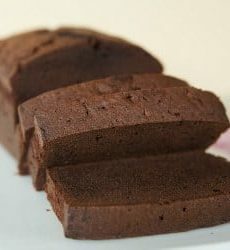 An easy chocolate pound cake that's moist, dense and packed with chocolate flavor. Adjust oven rack to lower-middle position and preheat oven to 325 degrees F. Grease and flour 8½x4½-inch loaf pan. In a small bowl, stir together the flour and salt. In a medium bowl, place the cocoa powder and chocolate. Pour the boiling water over the cocoa and chocolate and stir until the chocolate is melted and there are dry streaks of cocoa powder. Let cool for 5 minutes. Using an electric mixer, beat the butter, both sugars, vanilla and the chocolate mixture on medium-high speed until fluffy, 2 to 3 minutes. Add the eggs one at a time and beat until combined. Reduce the speed to low and add the flour mixture in 3 additions, scraping the sides of the bowl as needed. Give the batter a final stir by hand using a rubber spatula (the batter may look a little curdled). Pour the batter into the prepared pan and gently tap the pan on the counter to release air bubbles. Bake until a toothpick inserted into the center comes out clean, 1 hour to 1 hour 10 minutes, rotating the pan halfway through baking. Cool in the pan for 10 minutes, then turn out onto a wire rack to cool completely before serving, about 2 hours. The cake should be wrapped in plastic wrapped and stored at room temperature for up to 4 days.